Mozart: 18 piano sonatas. 18 editions. Talk to your music dealer. In addition, all of this is rounded off with observations on the significance of the sonata and historical keyboard instruments. A true treasure trove of interesting and exciting facts about Mozart’s piano sonatas! And only available on the Henle website. “Mozart is a touchstone of the heart. If I want to show my love to a dear person, I sit down at the piano and play for her a piece of Mozart”. In these words the great Mozart interpreter Edwin Fischer expressed an essential message: every note Mozart wrote is a reflection of his character – affectionate, sensitive and yet at the same time powerful and virile, abounding both of inspiration and an early acquired masterly control comparable in some ways only with that of Johann-Sebastian Bach. Mozart’s ability to express the deepest thoughts with the fewest notes is why it is so difficult to play his music properly. Technical prowess alone won’t do it. It requires the ability of a feeling heart to express music as an affectionate communication between performer and listener. No other classical composer labeled a movement “amoroso” (Andante of the Sonata in B flat major, K. 281). “Beethoven is superb, but Mozart is sublime”. It would be absurd to ask which of the two masters expressed more depth in his music. For a long time Beethoven was considered to be more profound; his works stood for the expression of the transcendental and ineffable. Indeed, in the variation movement of his last Piano Sonata op. 111 one senses an otherworldliness transcending normal musical expression. Both interpreter and listener should feel it. On the other hand, Mozart’s depth of thoughts and feelings is more elusive and not so easily recognizable. One can approach the mystery of Mozart only with the help of metaphors. His music has something comparable to the look in a child’s eye: unfathomable. Mozart’s sonatas are to me like a poem by Goethe: they simply exist and it is hard to believe that once they did. The clarity and lightness of Mozart’s creations led generations of music-lovers to the erroneous opinion that he composed his works without any effort, “as the bird sings”. In reality his works are the result of relentless learning and not little toil. Mozart had studied the compositions of the old masters as well as those of his contemporaries diligently, and he was constantly working on his own improvement. It was Joseph Haydn who best recognized the combination of God-given talent and acquired mastery in Mozart when he said to Leopold Mozart: “I tell you before God and as a honest man that your son is the greatest composer I know. He has taste and moreover the greatest knowledge of composition” (Leopold Mozart quoted these words in a letter to his daughter in Salzburg, dated 16th February, 1785). In the following I will describe the sonatas from my personal point of view. The group of the first six sonatas preserved were presumably composed in Munich from January to March 1775. Mozart himself called them “the six difficult sonatas” and played them several times on his tour to Augsburg, Mannheim and Paris (1777/78). The relatively late date of these first completely preserved piano sonatas explains why we are already faced with astonishing masterworks. Not only the sequence of the basic keys (C major, F major, B flat major, E flat major, G major and D major) of the six sonatas, but also a noticeable increase in virtuosity from the relative pianistic simplicity of the sonata in C major to the rather difficult sixth sonata, the Dürnitz-Sonatae, create the strong impression that Mozart may have intended to publish the usual cycle of six sonatas. In such cycles, composers were urged by publishers to start with an easier sonata and to finish with a brilliant one. Perhaps, Mozart was not able to undertake such a publication of a cycle publication; or did not want to pursue it in later years. Anyway, only the last sonata of the cycle appeared in print during Mozart’s lifetime, but this one, however, repeatedly. FIRST MOVEMENT Although the six sonatas were apparently written down more or less at the same time, there is reason to believe that at least the opening Allegro of the Sonata K. 279 was composed earlier. Unlike all the succeeding sonatas, it lacks a characteristic significant opening theme. Instead it starts with a series of four different motifs, in a way reminiscent of baroque techniques. All three movements are in sonata form. The first movement with its ornate figuration does not yet attain the melodic richness of the following sonatas; the structure is transparent and, after an extended development section, its main surprise is a different order of subjects in the recapitulation. SECOND MOVEMENT The two following movements, on the other hand, already match the succeeding sonatas. Especially pleasing in the C major Sonata K. 279 are the expressive lyrical Andante – (the triplet figuration of which foreshadows the famous Andante in the C major Concerto K. 467) and the lively and fresh Haydnesque Finale. THIRD MOVEMENT The second subject of the brilliant final movement, which opens the development, happens to be rhythmically identical with the finale motif of Haydn’s F major Sonata Hob. XVI/23 and – even more so – with the presto theme of Haydn’s B minor Sonata Hob. XVI/32. This is one of the many reasons to believe that Mozart most probably knew Haydn’s so-called six Kurzböck-Sonaten well. FIRST MOVEMENT All the movement of this second sonata are in triple meter, which was rather unusual in Mozart’s time. The first movement has the character of a lively menuet, despite the marking Allegro assai. It anticipates a certain mood of two other first movements in F major in three-four, those of the Sonatas K. 332 and K. 547 (the latter written originally for piano and violin). Thus key as well as metre characteristics inspired Mozart’s imagination in apparently similar ways. The first subject group of K. 280/I, the eight- and sixteenth (quaver and semiquaver) – movement of the first 12 measures, contrasts especially nicely with the triplets of the following 14 measures. SECOND MOVEMENT The second movement of this Sonata, and Adagio, is in F minor and in siciliano rhythm. It is one of the finest creations of the whole cycle. Perhaps it was written only shortly after the composition of the early G minor Symphony K 183, in which we find a similar mood reflected; but more obviously there is a certain affinity to the slow siciliano movement in the same key in Haydn’s F major Sonata Hob. XVI/23, and further similarities between the two composers’ sonatas emerge as the movement proceeds. In both pieces, the original lament of the siciliano resolves into a warm A flat major melody with a gently moving accompaniment. However, the Adagio marking classes this movement as the slower, more serious type of siciliano, an earlier model of which can be found in Bach’s harpsichord Concerto in E major. It also has an affinity with the immensely sad slow movement of the A major Concerto K. 488, which is likewise marked adagio instead of andante. THIRD MOVEMENT The finale of the Sonata, a Presto in three-eight metre, restores the joyful mood of the opening. It is Haydnesque, too, but more pianistic and longer, as well as richer in contrast than its precedent. SECOND MOVEMENT The second movement, an Andante amoroso (originally marked Andantino belongs to Mozart’s loveliest early works. It should be played with introspective devotion, not as a declaration of passion. Affectionate sighs alternate with the gentle flow of tender melodic phrases. THIRD MOVEMENT The final rondo is in gavotte rhythm; it is packed with the expression of high spirits and concerto-like effects, for instance with the short cadenza in measure 43 and the return of the theme beneath a trill accompaniment (m. 114f). The theme of the rondo is binary, the second part being a varied repeat in the sense of the C.P.E. Bach’s use of the term. The Italianate “Mannheim sighs” in measure 3 are repeated in the first episode. The second episode in minor introduces a hint of melancholy into the course of gay events, which the third episode also interrupts, this time with a loud, dramatically spread diminished-seventh chord (m. 102-104). The movement, which is related in form as well as key to the finales of the Sonatas K. 333 and K. 570, and also to that of the Concerto K. 238, comes to an end with a brief and wittily playful coda. FIRST MOVEMENT Remarkably, this sonata opens with a slow movement like the A major Sonata K. 331. But the form is not a Theme and Variation. Instead, the lyrical Adagio is in sonata form. It starts with an expressive theme in three-part writing which, surprisingly, is missing in the recapitulation and recurs only in the coda. The expression is so tender and intimate that this movement might well have been labeled “amoroso” like the Andante from the preceding sonata. What to our ear sounds typically Mozart is in reality an adaption from Haydn’s Theme and Variations in the same key, Hob. XVII/3, composed, but not printed, before 1774. Melody and harmony are practically identical, only the rhythm is different. Is this a case of unconscious borrowing? Maybe Mozart saw a handwritten copy in the possession of Haydn’s brother Michael. A grazioso second theme begins in measure 9. Basically, this is a simple binary motif, which is repeated and merges imperceptibly into the concluding thought of the exposition. The development begins dramatically with a highly charged diminished seventh chord followed by two short crescendos. Inspite of its small dimensions, this movement shows Mozart at his best – expressive, exquisite. He was meticulous in providing it with plenty of articulation signs and dynamic marks. SECOND MOVEMENT In contrast to this slow movement, the next one is a lively minuet with a relatively long trio section (labeled Menuett II), which clearly draws on Austrian dance traditions. Such folk or popular elements are relatively rare in Mozart, but this Movement is the exception, akin to the minuets of Beethoven’s Septet, op. 20 and his Sonata op. 49 N°2. THIRD MOVEMENT The finale, an irresistibly fresh and brilliant Allegro in 2/4 meter, concludes a distinctly original and lovable work. FIRST MOVEMENT The fifth sonata K. 283 (189h), in the pastoral and joyous key of G major, is especially popular; it again displays novel ideas, musically and pianistically. The diversity of its melodic invention is highly typical of Mozart, and so is the clear-cut sonata form of the first movement. The very first idea is a marvel of folkmusic-like invention. The opening theme and its continuation is an interplay of question and answer with the final response in baroque hemiola rhythm (a sudden 3/2 meter interpolated in a 3/4 movement). The ornamented unison passage which follows (mm. 16-22) is superbly written and sounds especially brilliant and full-bodied on the pianos of Mozart’s time. This tutti effect was one of his favourites, and he also used it in later works, such as the Variation on a Theme by Gluck K. 455 the Piano Concerto K. 456/I and the cadenza of the Piano Concerto in G major K. 453/I. SECOND MOVEMENT The Andante in C major is unpretentious, but with the help of subtle shading in performance, the repeated notes of the theme can become really effective. Unlike the first movement, which in place of a new development section simply presents a new idea followed by an extended transition to the recapitulation, the second movement contains a true development in the 19th century textbook sense, presenting the subject first in the right hand (in D minor and C major) and then in the lower register and so no. THIRD MOVEMENT A scintillating virtuoso Presto concludes this Sonata. At the very end, there is a typical Mozartian joke: he wrote the word Coda into the score; but instead of the expected elaborate epilogue, this tail consists of only two concluding chords. Mozart dedicated this Sonata to a Freiherr Thaddäus von Dürnitz – which is why it has often been called the Dürnitz-Sonata. It is undoubtedly the best, the most brilliant and the most technically demanding of these six early Sonatas. Understandably, Mozart retained a special affection for it and continued to perform it himself. It was this Sonata of which he said that it sounded incomparable on Stein’s new fortepianos. FIRST MOVEMENT A first version of the beginning of the first movement, written on one and a half pages, was cancelled by Mozart. On the same page, he started anew to write the final version underneath. The thematic material of this opening movement (and to a lesser degree also that of the following movements) is laid out on a more ample, nearly orchestral scale, a departure from the intimacy of the early sonatas. The tremolo effect in measures 13-16 and the unison announcements of the first subject read very much like a piano reduction of an orchestral tutti. The second subject, a supple melodic line, unaccompanied in its opening bar, incorporates a descending chain of first inversions a favourite harmonic formula of the baroque and classical periods. (There are analogous passages in the subsidiary themes in Gluck’s overture Iphigénie en Tauride and the first movements of J. S. Bach’s Italian Concert). This functions as a solo passage in contrast to the ensuing tutti entries in m.30. The development moves through a circle of minor keys before the recapitulation begins in measure 72. SECOND MOVEMENT Mozart called the second movement a Rondeau en Polonaise, so it is a dance. The opening four measures from a kind of dialogue (like the theme of the first movement of the preceding G major Sonata), and Mozart subjects them to felicitous counter-statement is heightened by Mozart’s meticulous dynamic markings. THIRD MOVEMENT The last movement of the Sonata is a pianistically rewarding, cheerful set of variations, which, up to the adagio variation, has the character of a gavotte. It shows Mozart’s special gift for writing variations at its most brilliant. The superficial impression of a diffuse form does not stand up to a closer inspection: it would not be at all easy to omit one of the twelve variations, or to add an extra one. The adagio variation is on special interest to Mozart scholars, for it gives us some insights into his concept of impromptu ornamentation. The autograph is only modestly ornamented, and Mozart presumably embellished it in performance as his fancy dictated. But a richly ornamented version survived in the first edition, published during Mozart’s lifetime, and undoubtedly this embellished version is Mozart’s own work. Who else could embellish in such an ingenious way? It illuminates Mozart’s ideas on ornamentation in general and in particular. The two sonatas K. 309 (284b) and K. 311 (284c) were presumably written in Mannheim in 1777, and the extraordinary sonata in A minor in Paris in 1778. These three sonatas are almost more consistent, more classical than the earlier Sonatas. FIRST MOVEMENT The first movement of the C major Sonata K. 309 is a model teaching sonata form structure. With sonata forms, as with Bach fugues, no formal dogmas underlie the process of composition, but each sonata varies anew a basic principle. For Mozart, this entailed strict adherence to certain fundamental patterns without his creative freedom. In his sonata movements in major keys, for example he favoured a distinct second subject in the dominant as most contemporary composers did. Haydn, on the other hand, reveled in experiment at this point. A brief analysis may help to demonstrate Mozart’s standard sonata allegro form and the first movement of it is an ideal example for such an investigation. The first subject is a distinctive, marcato opening followed by a five-bar response. The falling fourth and rising sixth of the opening is one of Mozart’s favourite motifs, his common melodic device. He often uses it in the minor as well as the major, and many of his themes start with this motif (e.g. the second movement of the A major Sonata K. 331, the Adagio in B minor K. 540, and subjects in the Symphonies K. 114, 124, 319/II and 551/II). The seven measures of the main theme are repeated, slightly varied. Measures 15 to 21 conclude the first subject group with an answering phrase (3+3 bars). The transition consists of new material and then, in measure 35 (after two measures of preparation comes a second cantabile theme, in the dominant (G major) comprising 2x4 bars, which is also repeated and proceeds to a spirited closing theme (concluding group) using passage-work (m. 43) and incorporating a delightful diminuation of measures 35-36 in measure 45. The exposition ends with a codetta of five bars. The development presents the opening motif first in g minor, and then the various ideas of the first subject are worked out. With this procedure Mozart is keeping much more closely to textbook principles than he usually does. Two further statements of the opening motif lead back to the recapitulation in measure 94. The second subject, now in the tonic, has surprisingly changed place with its accompaniment. The opening is recalled again in an effectively assertive coda. SECOND MOVEMENT The second movement of this sonata is an introspective Andante un poco adagio. In a letter Mozart stated his desire to make this Andante match the character of the young pianist Rosa Cannabich for whom he wrote it: “…she is a sweet, pretty girl, just like the andante. For her age she is sensible and level-headed; she is serious, and doesn’t talk too much, though what she says is pleasing and sympathetic”. THIRD MOVEMENT An elegant and smoothly flowing Rondo of unusually large proportions concludes this Sonata. FIRST MOVEMENT The first movement of this Sonata is, like the earlier Dürnitz Sonata (which also is in D major), an orchestral sounding brio movement; both works radiate with Mannheim exuberance. SECOND MOVEMENT The second movement might be described as a sonata movement without a development. Its song-like eleven-bar theme, 4+4 (3 1/2) + 3 (3 1/2), with a concluding note at the 12th measure, is followed by an episode and a wonderfully varied return of the theme in D major (m. 25) instead of a contrasting second subject. The recapitulation starts in measure 39. But no formal description can do justice to the poetical depth of this movement. Under the seemingly simple statements there is a profound undercurrent of emotion. Among Mozart’s contemporaries only Joseph Haydn could occasionally match such a wealth of expression. THIRD MOVEMENT The final movement is one of Mozart’s hunting rondos in six-eight meter, so often found in his piano concertos. It combines rondo form and sonata form brilliantly. The second episode in B minor has the character of a development section, crowned by a small written-out cadenza. This A minor Sonata suddenly opens a new world. Einstein may well have been right in assuming that the Sonata was written under the weight of Mozart’s grief at his mother’s death in Paris. FIRST MOVEMENT The first movement is marked “Allegro maestoso”, and the opening theme is indeed truly majestic: its dotted rhythms were formerly understood to imply majesty. The texture is orchestral in its fullness, and the relentless pulsing of the accompanying chords suggest majesty of a demonic and sinister kind. The first movement constantly alternates between anguish and resignation. Instead of a cantabile second theme (starting in measure 23) Mozart chose consistent semiquaver movement, followed by a two-part counterpoint passage in the left hand from measure 28 on. The last five measures of the exposition recall the dotted rhythm of the first subject. In the development, a storm breaks out; this passage is without parallel or precedent in Mozart’s piano works. The sudden dynamic contrasts between ff and pp and again ff, which Mozart prescribes here, foreshadow outbursts in Beethoven’s Sonatas. The two diminished-seventh chords in measures 126-7 heighten the expression of tragedy – a typical implication of this chord during the classical period. SECOND MOVEMENT The second movement of this Sonata (in F major) is marked Andante cantabile con espressione. This should be played with dignity, for unlike the warmth and grace of Mozart’s usual slow movements in a major-key, it displays a restrained passion. A second theme (m. 15 f.) recalls with its repeated notes the second subject of the Andante movement of the Symphony in A major, K 201. The development starts with a solemn elaboration of the opening theme and grows in intensity up to the climax at measures 43 49, again one of the most anguished passages in Mozart’s piano works, recalling thus the passionate expression found in the middle section of the preceding first movement. The recapitulation returns finally to the solace of the first subject. THIRD MOVEMENT The final movement, a Presto, reverts to the foreboding of the first movement; but instead of presenting the drama with the help of an orchestral texture, this finale gives a more subdued image of the underlying mood of tragedy. Mozart, unlike Beethoven, rarely resolved his minor-key works into radiant major finales; he seldom allows joy to conquer tragedy. Most of his minor compositions return to the spirit of the opening, as they do here. This Presto is one of the most desolate movements Mozart ever wrote, with its remarkable fluctuations between resignation and defiance and only a single subtly illuminating shaft of A major, a fleeting Fata Morgana. The next three Sonatas K. 330–332, hitherto wrongly dated “Paris 1778”, were in fact composed in Vienna (or Salzburg), in 1783 as recent paper research has clarified. This establishes that they were written after Mozart had emancipated himself from his father and the Salzburg Court. FIRST MOVEMENT This Sonata is in many respects a total contrast to the preceding work, with no trace of melancholy except for the sadness expressed in the middle section of the Andante. The first movement is exuberantly gay. SECOND MOVEMENT It is followed by an intimate Andante cantabile movement with a beautifully expressive minor episode and some fine contrapuntal part-writing in the episode’s A flat section. The numerous phrase marks and the careful dynamic indications testify to Mozart’s own fondness of his Sonata. By the way, the last four measures of this middle movement are not in the autograph – Mozart added them when the Sonata was given to the engraver. What a blissful afterthought! The A major Sonata has always been one of Mozart’s best-loved works. It begins with an intimate and elegant theme and variations movement marked Andante grazioso. Thus this composition differs from a usual sonata, as it has not a single movement in sonata form but is more akin to the divertimento form. Yet even here the movements are bound together by strong melodic and formal affinities. It is no accident that the end of the variation theme is repeated note by note at the end of the minuet, that the crossing of hands in the trio of the minuet is anticipated in variation IV, that the key of the finale (A minor) is prefigured in variation III, and that the ritornello of this famous Turkish march finale in A major is alluded to in measures 5 and 6 of the allegro variation. The irregular phrase-structure of the minuet is typically Mozartian. The double octaves in measures 20 24 of the minuet trio make pianistic demands unusual for Mozart’s time; this is the only occasion Mozart prescribes them in his piano sonatas. The delightful Rondo alla turca, with its imitation of Turkish music in the A major section, is justly famous. 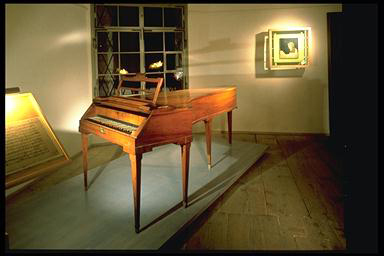 Here Mozart anticipated the “Turkish pedal”, an inbuilt percussion stop frequently found in Viennese pianos after 1800. An early fortepiano with a percussion stop is an ideal instrument for the interpretation of this sonata. FIRST MOVEMENT The Sonata in F major has a first movement in three-four meter, like K. 280 in the same key. The cantabile opening measures are followed by an unusually long answering phrase containing a wealth of melodic ideas, many of which are reminiscent of Haydn (m. 13 ff.). This movement is not a text-book example of sonata form, though the main characteristics – the threefold division into exposition, development and recapitulation, as well as the broad outlines of the key scheme – are present. However, there is a stormy passage in D minor and a modulation to C minor before the entry of the second subject in the regular key of C major. There are also many other details which demonstrate Mozart’s freedom in handling the sonata form, such as the hemiola rhythm in measures 64-65 and the new thematic material introduced at the beginning of the development. SECOND MOVEMENT The Adagio movement in B-flat major displays Mozart’s skill in varying repeats, and typifies his practice of enriching the ornamentation when preparing a composition for publication. Embellishments, previously probably “improvised”, now became standard when the work was published with the written-out enriched ornamentation. THIRD MOVEMENT The last movement is a rollicking virtuoso Allegro assai movement in six-eight meter, making higher technical demands on the performer than most of Beethoven’s sonatas. It proves that Mozart must have been the best pianist of his time. FIRST MOVEMENT This Sonata takes us into new realms of lyricism – we suppose that this is inherent in Mozart’s choice of key. The first movement opens with a cantabile theme which no one else could have written. It should be noted that measures 3 4 (with upbeat) are a variation of the initial phrase. A minor Italian composer might have repeated the opening statement one step lower; it still would sound well, but it would not be comparable in any way to the beauty of Mozart’s theme. The wealth of melodic and thematic inventions here and in the rest of the Sonata is simply staggering. How simple, in comparison, is Beethoven’s structure in his Sonata in the same key of B-flat, op. 22! In this Sonata Mozart anticipates in more than one way the “heavenly length” of some of Schubert’s Sonatas. SECOND MOVEMENT According to Daniel Schubart’s aesthetic theory, E flat, the key of the middle movement, was the key “of love, prayer, intimate converse with the Almighty, signifying the Trinity with its three flats”- a characterization which does seem to apply, for once, to this rather solemn and profound Andante cantabile movement. It is in sonata form, and sometimes gives the impression of having been conceived as a string trio. One of the boldest moments is the beginning of the development with its biting dissonances, all the more telling after the preceding euphony. THIRD MOVEMENT The somber ethos of E flat is dispelled by a concertante Rondo finale in B flat, although this good-humoured movement does retain a touch of seriousness – a sufficiently weighty conclusion to this fine Sonata. Several features – not least the tutti entry preceding the cadenza (m. 168) – suggest that this is a concerto movement in disguise. The insertion of a full-scale cadenza (m. 171) into a piano sonata movement is most striking, and this powerful one is only rivaled in Mozart’s Concertos. It far surpasses those in Haydn’s and C.P.E. Bach’s Sonatas. Following K. 333 (315c) Mozart wrote no more sonatas until the great C minor Sonata K. 457 of October 1784. Meanwhile he was writing and performing piano concertos – five in quick succession in 1783/84 (K. 449, 450, 451, 453 and 456) – for his subscription concerts in Vienna, which at first were very successful. It is no wonder, then, that the virtuoso brilliance on which his success in his subscription concerts depended can be detected in his later compositions. However, the C minor Sonata offers more than this: a shattering expression of personal anguish, and a new language altogether which set this Sonata at the beginning of an epoch. This is the work which made the deepest impression on Mozart’s direct contemporaries and successors, especially on the young Beethoven. Discounting Haydn’s quite different C minor Sonata (Hob. XVI/20), this is the first truly monumental work in the sonata repertory, designed for acoustics more spacious than those of drawing rooms. Although written when Mozart was at the peak of his worldly success in Vienna, in 1784, it is tragic to the core. During that year, he gave more than twenty concerts of his own works all of which were apparently fully booked: even in our modern “concert industry” era it is quite exceptional for a virtuoso, or even a famous composer-virtuoso, to make twenty successive appearances in a single city. Yet it was just at this time that tragedy, objective and subjective, took a grip on Mozart’s life, finally leading to his death in poverty. The C minor Sonata is the first of a series of tragic works in minor keys, which culminates in the unfinished Requiem of 1791. From the assertive opening on, the first movement is a sustained cry of protest, yielding at the end to a consoling Adagio movement, one of Mozart’s finest inspirations. It may be more than accidental that the A flat major theme of the second episode is almost identical with the adagio theme of Beethoven’s Pathétique Sonata. But the tragedy in Mozart’s Sonata will not be stemmed by this Adagio. It returns with shattering force in the final rondo in which lamentation, protest, resignation, breathless terror and despair are constantly interrupted by silences which render the cries vain and hollow. Yet the classical form is not undermined by all this subjective expression. Mozart’s music achieves greatness through the conquest of personal tragedy by inner order and discipline, and on this level he is Beethoven’s peer. In the first movement, the opening unison statement and its answer – like the themes of the K. 491 Piano Concerto and the K. 475 Fantasy – lead us to a profoundity which language is powerless to fathom. Although wrote Mozart the great “Fantasie” in which he achieves a unique blending of funeral C minor with demonic chromaticism – six months after the Sonata, he endorsed the intrinsic connection between the two works by publishing them together. They appeared under the title “Fantaisie et Sonate pour le Forte-Piano” in December 1785 with a dedication to Madame Therese von Trattner. Madame von Trattner (1758 1796) was a pupil of Mozart and the wife of Mozart’s wealthy and influential landlord. It has been suggested that an unhappy love affair with her might have provoked the serious expression of both works. However, no proof for this assumption is extant. This Fantasy might well be ranked as Mozart’s most significant single piano composition. Like the Sonata in C minor, it opens in unison, like the Concerto in C minor, it is chromatic. The chromatic steps around the fifth (F sharp, G, A flat) convey a sense of impeding doom, as they do in the main subject of the Concerto’s first movement. The Fantasy seems freely constructed, but is in fact most tightly knot. The overall shape is a succession of slow, fast and again slow sections, with a return of the first theme towards the end. The chromatically descending bass in measures 10-16 supports bold harmonies, with an almost Schubertian modulation from C minor to B minor. The two slow lyrical sections are in D and in B flat major, i.e. the supertonic of C and its mirror. It is worth noting that due to the intense modulations, this Fantasy has no key designation, but is seemingly written in C major. After the composition of the great C minor Sonata there is a turning point in Mozart’s sonata output. His writing assumes more subtlety, and a more pronounced inclination to contrapuntal writing – as in the first two movements of the F major Sonata K. 533. (Mozart himself later added the F major Rondo K. 494 as a third movement for this sonata). FIRST MOVEMENT The first movement opens rather conventionally; however, it then builds up a tension in the development from the simplest raw material. The recapitulation brings a further surprise by turning towards remote minor keys and adding another short contrapuntal development of the opening theme. SECOND MOVEMENT The second movement, an Andante, is all resignation and melancholy – undoubtedly the greatest movement in the Sonata. Unlike the more short-winded first movement, it spans a long melodic arch which never sags throughout the first subject group, right down to the half-close at measure 22. The anguished dissonance in measure 2 of the theme is quickly resolved, giving way to a sublime cadence on B flat with a hint of resignation. The polyphonic writing is meticulous, and the themes are fundamentally related as well as being contrapuntally viable (see the beginning of the development). The cumulative dissonant suspension towards the end of the development (measures 60-72) still perplexed musicians in the nineteenth century, and even today we can only marvel at the dramatic suspense of this linear part-writing. THIRD MOVEMENT After this Andante Mozart did not write a finale but chose the F major Rondo, composed in 1786, to round up the Sonata. It affords a point of repose; but despite Mozart’s extension of the rondo form by a contrapuntal cadenza-like section, and despite a wonderful episode in F minor, this piece lacks the tension which distinguished the previous movements, particularly the second. Mozart called his Sonata K 545 “Eine kleine Klavier-Sonate für Anfänger” (A little clavier sonata for beginners) when he entered the theme in the catalogue of his works on June 26, 1788. The Sonata is usually known as the Sonata facile, and it is considered easy to play, ideal for teaching purposes. While this is true, we must bear in mind that Mozart, like Bach and Schumann, maintained the highest standards when writing for students. The third movement, a Rondo, is perhaps the most child-like movement, and the innocently graceful G major Andante is based on a resourceful use of Alberti patterns. Despite its apparent simplicity this movement shows a surprising depth of emotion, especially in the second episode which turns into the minor key. Many of Mozart’s works in B flat major, among them are the Concerto K. 595 and this Piano Sonata K. 570, are characterized by gentle, sometimes somber resignation. FIRST MOVEMENT Compared with the rhythmically similar opening of the F major Sonata, K. 332, this B flat major Sonata is lacking in energy and drive, and the beginning of the melody of the first-subject swings like a pendulum around the tonic. As in many late works, Mozart makes ample use of counterpoint in a gallant manner. The movement has no well-defined contrasting theme, but approaches the monothematicism of many Haydn sonatas. When the opening them appears in the function of a secondary subject, it is enriched by a counterpoint in repeated notes which anticipates the fugal subject of the overture and Papageno scenes of The Magic Flute. Nor is Mozart the dramatist is totally absent in this movement: the development plunges us abruptly – and with great effect – into D flat major. Tension mounts as the second part of the theme rises in pitch and volume (measures 84-94), leading to a soft G major bass entry of the first subject. SECOND MOVEMENT The thematic economy of the first movement and the skillful exchange of material between the hands are somewhat reminiscent of Haydn. This is not so in the introspective Adagio in E flat major. It expresses resignation but without bitterness: a sublimated farewell, music free from earthly trammels. This movement is in rondo form and its first episode in C minor is closely related to the C minor passage in the central movement of the Piano Concerto K. 491, measure 14 being an almost direct quotation. THIRD MOVEMENT The final rondo, in the so-called French rondo form with a “missing” ritornello in the middle of the movement, relates to The Magic Flute motif in its second episode. Less other-worldly in character is the last of Mozart’s piano sonatas in D major. It has often been called the Jagd-Sonate (Hunt Sonata); its key and six-eight time signature set the mood vividly. In a letter of 1789 Mozart told his creditor Puchberg that he intended to write six simple sonatas for Princess Frederica of Prussia in order to raise some money. This is apparently the only he completed and, far from being easy, it demands a high standard of finger technique. FIRST MOVEMENT As in so many works of his last years in Vienna, this Sonata features subtle contrapuntal interplay of deceptively simple material. In the development, the theme enters in new canonic imitations, first a measure apart (measures 63 64), later only half a measure (m. 70), leading to an impressive climax with a modulation to F sharp major (m. 77 f.), and a return through the minor keys (F sharp minor, bar 83; B and E minor). The recapitulation starts in a measure 99 after a brief transition; it rearranges and modifies the exposition material in a true Mozartian fashion. SECOND MOVEMENT The A major Adagio movement is in a straightforward ternary form with a middle section of sweet melancholy in the relative minor. Mozart may originally have devised this as a four movement sonata, in line with his string quartets and symphonies, in which case the fragmentary Minuet K. 355 (594a), the chromaticism and polyphony of which is closely related to this Sonata, was probably intended as the third movement. THIRD MOVEMENT The rondo finale is more contrapuntually conceived than a superficial impression would suggest. Particularly impressive are a canon using the rondo and its inversion (measures 34 ff. ), and a canon in the fifth in the development section (m. 103). 1. Eva Badura-Skoda and Paul Badura-Skoda, Interpreting Mozart. 2. Siegbert Rampe, Mozarts Claviermusik. I was converted to the Mozart piano in 1948, after a series of private concerts at which the remarkable Isolde Ahlgrimm played Mozart’s Piano Sonatas on a Walter pianoforte. Before that I had looked upon those apparently primitive instruments with some arrogance and shared the widespread prejudice that the use of such instruments offered nothing but a historical interest. During those private concerts though, I clearly realized that here indeed was the authentic sonority and that the works touched the hearer with more immediacy than they did on an interpretation of equal quality but given on a concert grand. The silvery clearness of the sonority, the nuances of registers, the subtlety of the dynamic gradation and above all the sweet noble tones of the middle register remain truly unequaled. I would not by any means deny the modern piano its qualities. First of all, its sonority definitely more powerful but consequently thicker makes its use possible for concerts in large halls; the perfection of its mechanism permits a larger dynamic scale and a more precise execution of the rapid ornaments, hardly conceivable on a fortepiano. Naturally, the use of an ancient pianoforte or a copy does not by any means guarantee an authentic reproduction. 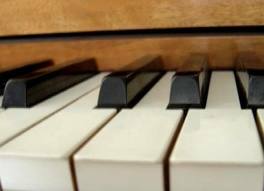 Indeed, a great adaptation is required of today’s pianists, because our hands have become too heavy and massive owing to the increase in mechanical weight and to the depth of the keys. This means first of all that the playing usually based on the weight of the arm and of the hand must be replaced, on a pianoforte, by a delicately articulated, purely digital playing. This is the only possible way of achieving the many subtle articulations and above all the nuances of staccato playing that are essential to XVIIIth century music. Thanks to this discovery – the result of ten years’ research – my approach to the modern piano has been able to acquire a transparency in my playing which I would never have imagined could be possible. How wonderful if, not only good harpsichords but also good pianofortes could be available in all music academies dedicated to XVIIIth century music! For, if so many good musicians continue even now to prefer the round, comparatively even sonority of the modern piano, the reason is that only in a few cases is a historical instrument in sufficiently good condition to meet the strict artistic requirements of a Mozart Fantasy or a Haydn Sonata. Therefore it was an exceptional stroke of luck when, after a long activity as collector, I was able, a few years ago, to purchase a collector‘s piece by Johann Schantz who was held in Mozart’s time as the best Viennese piano builder with Anton Walter. Having been kept in a mansion ever since it was built (ca. 1790), and in favorable climatic conditions, this pianoforte thus happens to be in an ideal state of conservation. Originally Paul Badura-Skoda wanted to become an engineer, but luckily he changed his mind. Nowadays, he is applauded in all the world’s great concert halls, from Carnegie Hall in New York to the Golden Hall of the Musikverein in Vienna. He goes on extensive concert tours on all continents, plays with leading orchestras and can be found in the recording studios of the celebrated record companies. In other words, Paul Badura-Skoda is one of the most important pianists of our time. One thing has remained with him from his early professional interests - the desire to 'look behind the scenes', to understand the functioning and the impact of great musical works and, in playing them, to make the perception accessible to others. In this critical appraisal first editions and autographs are compared, text deviations investigated and historical instruments are used. Not only does he play music, he also reflects on it, producing numerous cadenzas to Mozart concerti and style-sensitive completions of unfinished works by Mozart and Schubert (G. Henle Verlag). The musical personality of Badura-Skoda is characterized by complete immersion in music, a passionate search for the essential, and a sense of artistic responsibility, but not in a technical or academic sense. As a critic once said, 'Paul Badura-Skoda makes us feel something which is rare in a professional musician - that he loves music with every part of his being'. Paul Badura-Skoda was born in Vienna in 1927. His unusual musical talent very soon became evident and was appropriately encouraged. Unforgettable concert performances by Edwin Fischer, Hans Knappertsbusch and Wilhelm Furtwängler during the war strengthened Badura-Skoda's intention to become a musician. The young artist was not only impressed by the remarkable interpretations he heard but more so by the evidence of the ethical power of music they provided - an aspect that he still emphasizes today. In 1945 Badura-Skoda entered the Vienna Conservatory. Only two years later he attracted attention when he won the first prize of the Austrian Music Competition. A scholarship for Edwin Fischer's master classes in Lucerne was the prize, and also the starting point of the maestro's friendship, which laid the foundation for Badura-Skoda's artistic future. A few years later the young pianist became Fischer's assistant, and after Fischer's death, he continued the tradition of his master classes in Vienna, Salzburg, Edinburgh and Siena. Even today Badura-Skoda still keeps close contact with young artists. Again and again he devotes precious time and enthusiasm to the strenuous office of jury member in important piano contests and advises young artists. No-one who has heard him speak about music with warmth and perception in his soft Viennese voice, can ever forget it. In 1949 Wilhelm Furtwängler and Herbert von Karajan became aware of Badura-Skoda's outstanding talent. They invited him to play concerts, and practically overnight the young Viennese pianist became a world-famous artist. He made a spectacular debut at the Salzburg Festival; and at his first concert in New York in 1953 the hall was quickly sold out, something that hardly anyone before him had experienced. This sensational success was repeated a few years later at his debut in Tokyo. Record companies were not long to wait - for years he was the pianist who had the largest number of long-playing records on the market. Since then, Badura-Skoda has become a regular and celebrated guest at the most important music festivals. The conductors Wilhelm Furtwängler, Joseph Krips, Karl Böhm, Hans Knappertsbusch, Hermann Scherchen, Artur Rodzinsky, Lorin Maazel, Georg Szell, Sir Charles Mackerras, Sir Georg Solti and the violinist David Oistrakh have been among his famous partners. He has recorded a vast repertoire - more than two hundred long-playing records and dozens of compact discs appeared, including complete cycles of the piano sonatas of Mozart, Beethoven and Schubert. But Badura-Skoda does not limit himself to playing the works of the classical Viennese composers, his repertoire reaches from baroque to modern music. Indeed, Badura-Skoda does not agree with narrow specialization. He conducts, composes, works in musicological areas, writes books on music and - collects. Besides a huge archive of autograph microfilm copies and first editions, he is the proud owner of an extensive collection of historical keyboard instruments. It is a unique experience to be shown around this treasury by the owner himself. 1976 the Austrian State honoured Paul Badura-Skoda with the „Österreichische Ehrenkreuz für Wissenschaft und Kunst”, 1978 Badura-Skoda received the "Bösendorfer-Ring" which had been given only to Wilhelm Backhaus before, 1988 he received the Gold Medal of the City of Vienna, 1993 the artist was nominated „Ritter de la Legion d’Honneur” and 1997 „Commandeur des Arts et des Lettres”. On the occasion of his 80th birthday Paul Badura-Skoda was honoured by the Austrian Government in receiving the „Große Silberne Ehrenzeichen für Verdienste um die Republik Österreich” and from the City of Vienna he received the” Goldene Ehrenzeichen für Verdienste” um das Land Wien. The Staatliche Hochschule für Musik und Darstellende Kunst Mannheim and the Pontificia Universidad Católica del Perú honoured him with the title Doctor Honoris Causa.